Meguiar's started back in 1901. 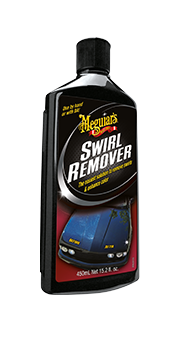 Frank Meguiar, Jr and his family, created his first bottle of furniture polish in his garage with an eggbeater and a tin bath. Each night enough polish would be made to fulfil orders for the following morning and pay for that day’s groceries. The operation’s grown more than a little since. Then in 1910, with the rising popularity of horseless carriages, Frank Meguiar, Jr. spotted that the mainly wooden automobiles were coated with the same finishes that were applied to furniture. 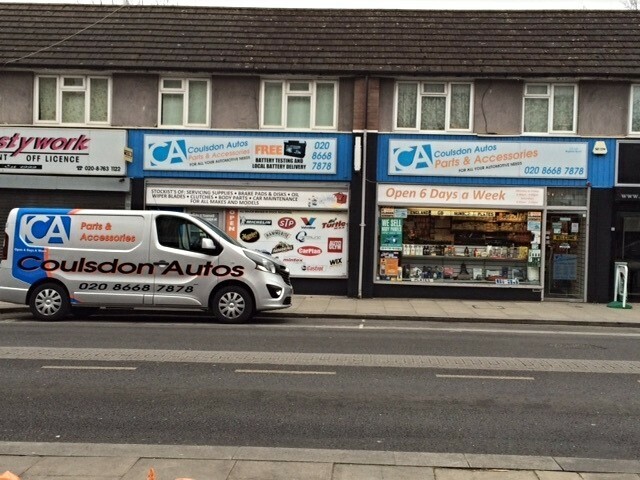 An obvious transition soon followed leading to a long-standing relationship in the automotive industry. The next big leap foward for them was back in the 1950s. Following the passing of Frank Meguiar, Jr. the family business is taken to the next level by his three sons. Maurice, the eldest, managed sales while Kenneth, the youngest, was in charge of production. It was Malcolm who shared his late father’s love for formulating and it was this passion that led Malcolm to create many of the company’s existing products including Meguiar’s Cleaner Wax – the number one selling liquid car wax in America. Back in the 1960s the car show were becoming increasingly popular, enthusiasts began to recognise that it was Meguiar’s polishes that were creating the brilliant high-gloss finishes on display. Retailers began to be inundated with requests to stock Meguiar’s Mirror Glaze products, which at the time were only available for professional use. In 1973 following the constant demand from enthusiasts for a consumer range of products, the Meguiar’s brand of consumer automotive products, the Classic line, is officially introduced. Happily, over 40 years later that marketplace enthusiasm still remains as high as ever. It stayed that way for a few years until 2004 when they brought out their NXT Generation line. 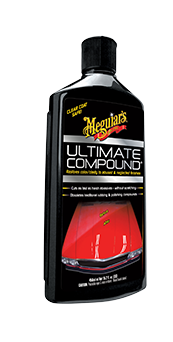 Then in 2008, the most technologically advanced and best performing range of Meguiar’s products is unveiled to the world, as the Ultimate line featuring the ever-popular Ultimate Quik Detailer hits the shelves. And Meguiar's has been top of the pile since. Whether its interior, exterior, detailing or just need a chamois to dry with Meguiar's do it all. Meguiars have developed SwirlX to eliminate your number one problems....Spider webs, holograms, towel marks, swirls. SwirlX easily remove swirls and light scratches from all paint finishes. SwirlX is clear coat safe and consumer friendly. In addition, Swirl Remover can be applied by hand or with a polisher and leaves a brilliant, swirl-free surface that maximises gloss and reflectivity. It comes in a 450ml bottle. 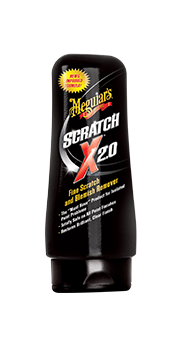 Meguiar’s for isolated scratch and scuff removal, Scratch X 2.0. This new formula has been specifically developed for hand application to quickly remove isolated scratches, fingernail marks, paint transfer and parking lot scuffs. Unique micro-abrasives correct these defects fast and are completely clear coat safe. Not just a “cover-up”, Scratch X 2.0 is a special formulation designed to completely remove scratches, ensuring that once they are gone, they stay gone! ​It comes in a 207ml bottle. Their new abrasive technology quickly removes stubborn oxidation, stains, bird dropping blemishes and other sub-surface defects while polishing the surface to a mirror finish. Unlike traditional rubbing and polishing compounds that scour the surface, their new clear coat safe micro-abrasives produce an amazingly clear finish that is free from scratches, hazing and swirls. Tree sap, overspray and industrial fallout are just a few of the contaminants that bond to your paint’s finish, making it ‘gritty’ and lacklustre. 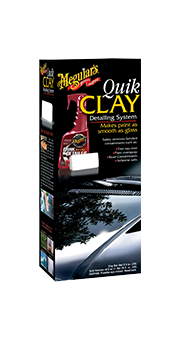 Meguiar’s Quik Clay Starter Kit will quickly and safely restore a smooth-as-glass finish. Polishes and waxes then apply and wipe off in less time with dramatically improved results. This Kit includes: 473ml Quik Detailer, 1 individually wrapped 50g clay bar. 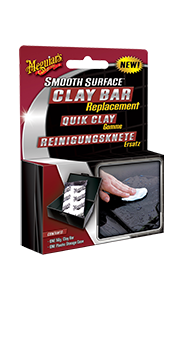 Our replacement clay bar makes it convenient for you to replace just the clay contained in our clay kits. This non-abrasive clay bar safely, easily and instantly removes paint overspray, fallout, environmental contaminants and more, making waxing easier and more durable. Quik Detailer is the missing link between washes. Simply spray on and wipe off with a microfibre cloth. 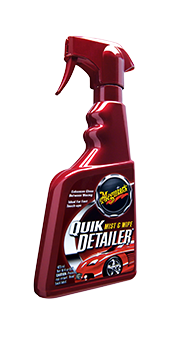 Quik Detailer removes contaminants safely without scratching your paint. It is no wonder Quik Detailer is quickly becoming a favourite with owners of the UK’s best show cars. It comes in a 473ml bottle. 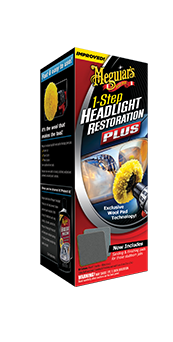 Meguiar's Headlight and Clear Plastic Restoration Kit restores like-new clarity to cloudy, scratched, oxidized and yellowed, uncoated plastic surfaces. Meguiar's unique Plast-RX formula works in tandem with our unique buffing pad and your drill to safely deliver amazing results in just minutes! No extra steps, complicated solutions or sanding with abrasives that can damage plastic and surrounding paint and trim. This Restoration Kit effectively removes fine scratches, surface contaminants, oxidation, cloudiness and yellowing, leaving plastics brilliantly clear and polished from headlights, brake lights, plastic convertible windows, motorcycle windscreens, helmet face shields, boat windows and more! ​The kit comes with a bottle of Plast-RX. This easy to use, rich gel formula quickly restores optical clarity to both rigid and flexible clear plastics. Cutting-edge advancements in Meguiar’s exclusive Microscopic Diminishing Abrasive Technology (MDAT) easily removes oxidation, chemical degradation, contamination, stains and light surface scratches. 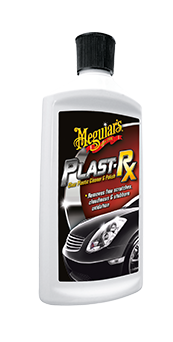 Plast-RX also contains long lasting durable protection to keep your plastics clear and beautiful longer. Plast-RX is non-toxic and does not contain harsh solvents. It comes in a 296ml bottle.